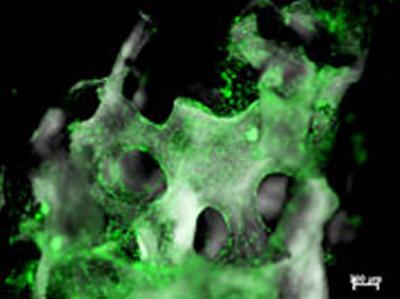 Scientists at the University of Southampton are to study the 3D architecture of healthy human tissues down to the nanometre scale (one billionth of a meter), to develop regenerative cell techniques for musculoskeletal repair. Funded by the Medical Research Council, the study will aid the team in the creation of accurate artificial scaffolds for growing replacement parts from stem cells for tissues such as cartilage and bone. The funding is part of a £25m investment from the UK Research Councils, in research and equipment to support regenerative medicine therapies. Regenerative medicine aims to make tissues and organs repair damaged and diseased tissues and restore the body to its original health. It uses stems cells and progenitor or precursor cells that, under exactly the right conditions, will change into the specialized cells needed to repair the tissue. Scaffolds upon which the cells can grow and be guided are used to help organise the cells into the right structures. The Southampton team, a multidisciplinary group of academics from Medicine, Engineering and Life Sciences, will use three imaging systems specially designed to create 3D images of tissues and scaffolds at three different scales to study the regenerated tissues. The highest magnification uses a scanning electron microscope combined with a microtome, which gradually removes very thin (<50nm, more than 1,500 times thinner than a human hair) slices from the sample. This creates a stack of images representing the structure of the cells down to the components making up the cells and the fine detail of scaffolds. Using this technique will allow the team to clearly see the membranes within the cells. The next level of magnification uses a light microscope that shines a very thin sheet of light (4 to 10 micro meters). The researchers will be able to look at much larger blocks of tissue (up to a cm cube - a sugar cube) without cutting it and then create a 3D image stack to represent the cube. Individual cells will be easily seen and can be labelled so cell types can be tracked over time in the new tissue. There are some samples that light will not penetrate or that are too large - for these samples the third instrument, a high resolution microCT (computed tomography) imaging device will be used. This uses X-rays to image through large samples without damaging them. The team will be able to distinguish individual cells and some of their features in a way that is not currently possible. Professor Richard Oreffo, who is leading the Southampton study, comments: “Increased aging populations pose new challenges and emphasize the need for new approaches to augment and repair tissue lost through ageing, trauma or disease. Regenerative medicine promises to deliver specifiable replacement tissues. “One of the most important factors that determines the effectiveness and normal functioning of a tissue is the way it is structured or arranged (the architecture of the tissue). “As living tissue is inherently 3D, understanding cell interaction, differentiation and tissue architecture is vital. This tissue architecture is important at many different scales, from individual cell components to the large scale organization of structures such as bones or blood vessels and nerves supplying the organs. Three UK Research Councils are investing £25m in research and equipment to support the development of regenerative medicine therapies for a range of applications, including Parkinson’s disease, cardiovascular disease, wound and musculoskeletal repair, eye disorders and deafness. £4.5m will set up a new ‘Hub’ for pluripotent stem cell research as part of the UK Regenerative Medicine Platform (UKRMP), funded by the Biotechnology and Biological Sciences Research Council, Engineering and Physical Sciences Research Council and the Medical Research Council (MRC). The Hub will work with the other strands of the UKRMP to tackle some of the critical challenges in developing new regenerative treatments from discoveries made in the lab. A further £20m of capital funding from the MRC will provide state-of-the-art facilities and equipment to support the work of the UKRMP and the wider regenerative medicine research community.